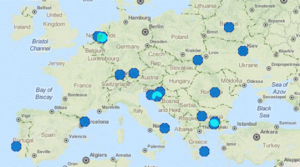 This year’s first web-based seminar of the European Rewilding Network took place end of March. Members from 14 European rewilding sites joined in and discussed how to engage students in rewilding related work. The participants addressed the great potential of involving this young generation and shared experiences about how to best start internship programmes. Students doing rewilding related field research in Western Iberia rewilding area, Portugal. Within the European Rewilding Network (ERN) members actively exchange and share ideas and best practice examples to inspire each other through webinars, which have turned out to be a successful tool to achieve this. This broadens each other’s knowledge and further improves the ongoing rewilding efforts within this growing network. 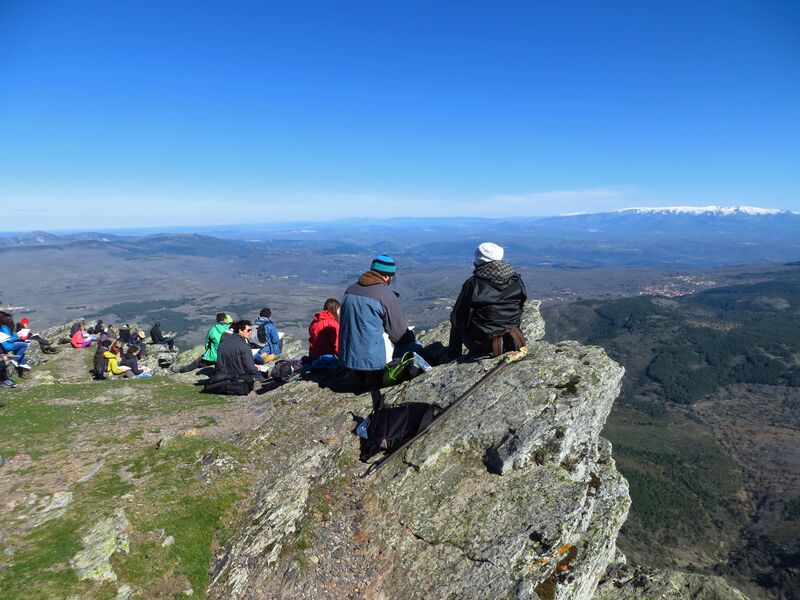 While the majority of Rewilding Europe’s supports is in the age group of 25-34 years, we believe it is important to engage with the younger generation as well, in particular students in the age class of 18-23 or younger – as they will become the future conservation leaders. Already, the increased public interest in ‘rewilding’ is reflected in the increasing number of students that apply for internships – while we have limited capacity for on-site internships! Active engagement of students unlocks great potential to learn from the results of their studies. Students are often very open minded, have a modern way of thinking and are interested in innovative methods, all of which can be of great value for the rewilding efforts at a specific site. Furthermore, involving interns makes it possible to undertake useful or even necessary studies that would not be possible otherwise due to lack of time or capacity. During the webinar, two speakers provided first hand experiences focusing on opportunities to involve students. A total of 20 attendants from 12 countries from all over Europe, working on in total 18 rewilding projects and activities, participated in the event. 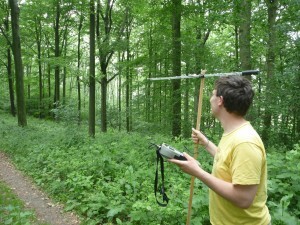 Researcher Rene Jansen seeking wildcat with the help of transmitters. Frank Zanderink from ARK Nature was the first speaker who shared his thoughts about the potential and pre-conditions for successful internships in rewilding initiatives. Frank deals with student applications for ARK Nature as well as Rewilding Europe and has assisted many students in finding a suitable internship environment in the Netherlands as well as abroad. During the past two years, as many as 90 students annually and from all over the world, from Vietnam to the USA, expressed their interest to focus on rewilding as part of their education. For a minority of them, a suitable internship position was found. Indeed this indicates both a strong interest and great potential but also a limited capacity so far for students to take part. Among other topics, the interns studied the relation between wolves and their prey in Bulgaria, monitored the distribution of the wild cat in the Netherlands, made an inventory of the tourism potential in the Rhodope Mountains, and investigated the carrying capacity of Konik horses on Jelgava Island in Latvia. As he helped to provide internship positions and supervised several students, Frank explained the advantages and also addressed the possible drawbacks one might stumble upon. Apart from being enthusiastic, flexible and available for a fixed time, students are involved in an aspect of their mentors choice and have to provide an end-product. Engaging and supervising interns is rewarding but also time-consuming and sometimes challenging. It is important to make upfront arrangements concerning transportation and housing to ensure a good working environment. Students can be partially or even fully financially independent, for example by applying for an Erasmus scholarship themselves. 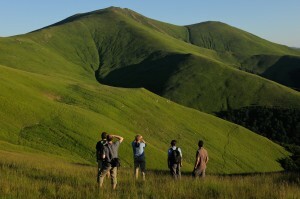 Field work in Tarcu Mountains, Southern Carpathians, Romania. Next speaker was Adrian Hagatis, team leader of the Southern Carpathians rewilding area in Romania, giving insight in his team’s rewilding work that focuses on the reintroduction of European bison. In this rewilding area there is great potential for interesting field studies that students can carry out, which could bring valuable information for the project. By collecting and analysing field data teams gain important insight and knowledge on bison behaviour like spatial distribution, behaviour and population dynamics, which could inform management of the population and the rewilding area. Adrian mentioned that the newly started ‘Wilderness Innovation Lab’, co-financed by a Swiss grant, will open up to six internships for students together with accommodation. Key aspect will be to translate available bison data for the general public in the local visitor centre as well as online. By doing so, the results of the internships will have an even broader function then being of local interest only. 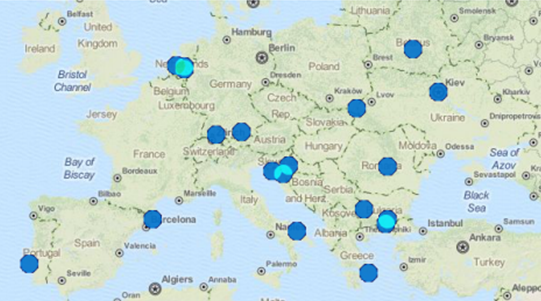 Locations of European Rewilding Network members attending the Webinar. After both presentations, a vivid discussion followed with various topics from criteria and recommendations for student selection, to practical matters like insurance for students and the material they use. The internship protocol Frank explained was also discussed in detail and was provided to be used by the network members. Overall, the webinar provided very useful insights and suggestions from participants on what it takes to start internships and involve students, and to make this successful and beneficial for both the students and the rewilding projects concerned. Nearly 50 inspiring rewilding examples from all over Europe are already part of the European Rewilding Network. Together, we aim to actively share information and bring the concept of rewilding forward as a conservation approach. Rewilding Europe warmly welcomes new members to the network, as we believe that sharing and discussing rewilding experiences will be useful for all of us working to make Europe a wilder place. Please feel welcome to have a look at how your inspiring rewilding initiative could also become part of this growing network at www.rewildingeurope.com/rewilding-network/. Find out more about internships and how you can apply here.